Hydrant Flushing: Why is there water spraying into the street? Have you ever seen your local water agency releasing water from a hydrant and wondered why water was pouring out? While noticing this, amidst California’s current drought, you might think that the same water agencies that are asking customers to conserve are themselves wasting water. Contrary to what you may see, hydrant flushing is required and necessary to maintain water quality for potable (drinking) water. Our cities have a complex system of water pipes that deliver water. This system requires regular monitoring to ensure safety for all who use it. 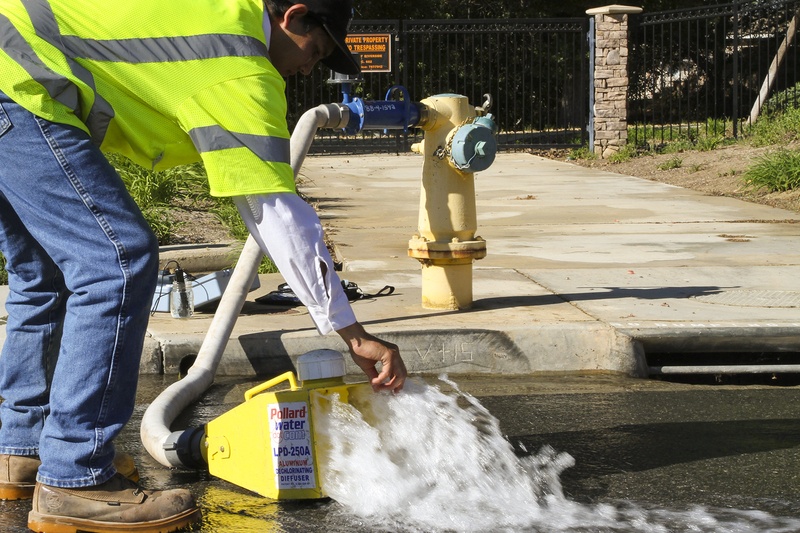 California requires water agencies to meet regulatory requirements, which sometimes involves hydrant flushing as a means to remove contaminants. The process includes releasing water from drinking water pipes and flushing it out of the system. When hydrants require a flush the process can take between five to fifteen minutes depending on the rate of flow. Following a flush water samples are often gathered and sent to a lab for testing of coliform bacteria. Similarly, if a leak is found in a water main maintenance is required. After the line is repaired, water is flushed and then tested for contaminants before the main can go back online. “Hydrant flushing is a public safety issue. Before we deliver water into our customers’ homes, we make sure that it is safe for human consumption,” says Guerrero. 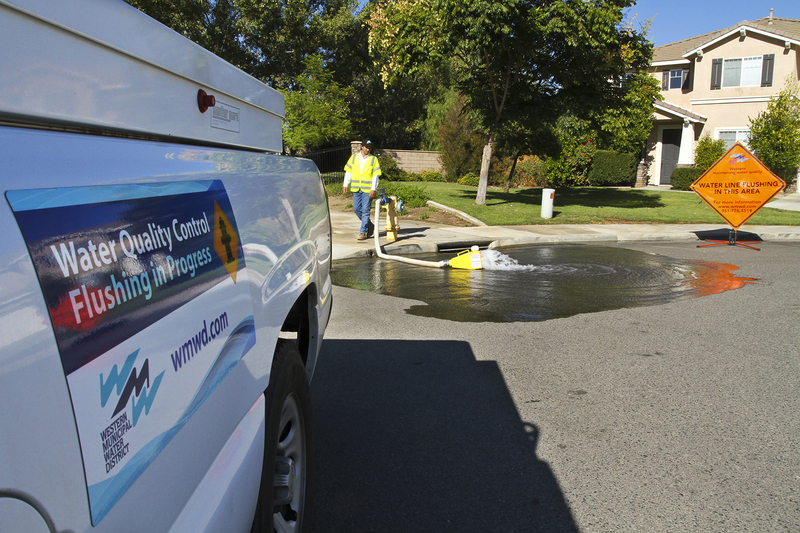 Local water agency, Eastern Municipal Water District, is minimizing the amount of water loss from hydrant flushing. In an effort to reduce water waste during the drought, crews will either use sandbags to divert water into the sewers or use a pumper truck to collect the water whenever possible. Both methods create a means for water to be sent to a wastewater treatment plant, be cleaned and reused where recycled water is permitted. Water that is not collected is not a complete loss. While some water may take a path through the storm drain, water often follows a natural path as water runoff, which can lead to local rivers or be absorbed by the soil and seep into groundwater supply. Water that does not flow into the storm drain can rejoin the watershed. Hydrant flushing can cause a slight disruption to customers within proximity to a hydrant due to possible sediments that may be present. It is customary for water agencies to notify customers prior to the flushing and to have them run water in their homes and businesses prior to resuming water usage indoors. Over time, natural sediments and deposits gather in water lines. If not removed, or flushed, this build-up can create odors, discoloration or contamination to the water supply. Hydrant flushing is a routine prevention maintenance activity throughout the country. While the process may appear to demonstrate water waste, flushing is necessary to maintain a reliable and safe water supply. Will El Niño solve California’s drought?